The 2012-13 season probably had to finish like it did for the Bulls Wednesday in a series closing 94-91 loss to the Miami Heat, impressive in their resolve and refusal to yield against long odds while an if only and a coulda and shoulda away from yet another improbable victory. The Bulls made Miami sweat again. They would make it no day at the beach for LeBron James and the defending NBA champions. But the Bulls would once again spend the summer receiving praise for only being almost good enough. “I’m proud of my guys,” said Carlos Boozer, who had a big finish with 26 points and 14 rebounds, including nine offensive, three more than the entire Miami team, and a last one with 14.9 seconds left to give the Bulls one final shot at a tie that went awry. Perhaps that’s what this season was all about in the wake of the opening day of the playoffs just over a year ago when Derrick Rose suffered a catastrophic knee injury and would be lost well into the season. It turned out to be for the entire season, and both coach Tom Thibodeau and Joakim Noah said after Wednesday’s loss that Rose had done the right thing in sitting out. “Definitely, it was hard,” Noah with three points and nine rebounds said about Rose’s absence. “As a player, you want him to come back. So then what sort of season could it be? And then both Kirk Hinrich and Luol Deng would miss the entire conference semifinals against Miami with illness and complications from that and injury in what would be the first four-game losing streak for the team since the 2011 conference finals against these same Heat, another 4-1 playoff series defeat. The Bulls won 45 games, went on the road to win a first round seventh game in the playoffs in Brooklyn, and then played the defending champions as tough as they always have, a win in Miami, a narrow loss in Chicago and another one in Game 5 despite falling behind by 18 points less than seven minutes into Wednesday’s game. It was a time for a team to give up, and we’ve seen plenty of these seventh game blowout losses when things begin to go badly. But the character of this Bulls team was no lack of surrender no matter the circumstances, the predictions or expectations. “A lot of guys would’ve laid down, but we didn’t,” said Richard Hamilton. It’s continued to gain this group respect and admiration, if not nearly enough ultimate accomplishment. Though what was one to expect? You lose the league MVP. You are missing your big men anchors, Noah and Taj Gibson, for most of the last month. You spend much of the playoffs without your two best perimeter defenders and your best playmaker. You’re starting three players who opened the season as reserves. “It’s always disappointing, hard to lose,” said Noah. “But I’m really proud of this team, really proud of the character of this team and how hard we fought this year. No question it’s hard right now. We just lost. It’s hard to sit here knowing the season is over. But there are a lot of positives. Again, like too many times in these last three seasons it seemed like maybe they would, maybe they could. They almost did, but then something, something always goes wrong or doesn’t go in. This time it was a pair of desperation threes by first Nate Robinson and then Jimmy Butler that amazingly enough after the Heat took a 93-86 lead with 3:02 left that could have tied the game in the dying seconds. But too many seem to end this way for this group, though it would be difficult to expect anything otherwise. This group ought to double as coal miners the way they dig out of so many holes, whether serendipitous or of their own making. It’s an all too frequent destination for these Bulls, as terrific as this season really was. One could dream of conference finals and titles. One realistically couldn’t expect any more than they accomplished, and would hardly have been surprised with a lot less. 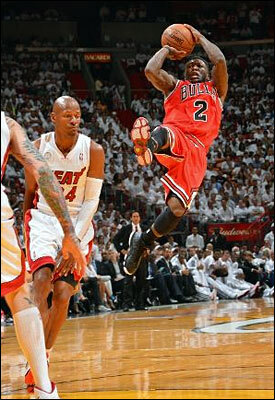 But there were the Bulls staggered, the Heat with 10 straight points to open the game, ahead 18-2, then 22-4. Pass the lotion: It’s a day at the beach! And the littlest would lead them. Not that anyone was giving up, anyway. This Bulls team may not be one of exceptional talent, except perhaps stubbornness in its refusal to accept the inevitable. James had 10 first quarter points, mostly from the free throw line as he was pounding away at the Bulls interior, the Heat with nine free throws in the quarter to one for the Bulls. Udonis Haslem was making jump shots. Dwyane Wade, who was a game time decision with his balky knee, had thrown away his cane and walker and had four points (eventually 18 to support James’ 23). 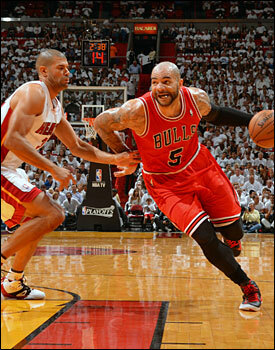 But Boozer, who had struggled earlier in this series, was a stopper this time and went on to his sixth double/double of the playoffs to lead everyone. He bulled in for a score and then took an interior pass from Noah for another. Hey, they’re on the scoreboard as well! The Bulls varied a bit from their traditional pick and roll offense with Robinson the Heat were so effectively trapping. The Bulls were making some plays through the big men, and after a slow start by Marco Belinelli, Thibodeau went to Hamilton again and the veteran produced another good effort with 15 points off the bench. Hamilton had played just a few minutes in the playoffs before Monday, and Thibodeau was questioned afterward about going to him so late in the series while the Bulls suffered with scoring changes and had trouble passing inside, which Hamilton does well. Thibodeau isn’t a coach who ever singles out a player for criticism. So he’ll take the hit on this one. And not that Hamilton didn’t produce. He did, and he helped the team. And he remained a strong, supportive teammate throughout. But Thibodeau had kept him out primarily for defensive reasons. While Hamilton still can play and help teams, his defense against the best isn’t as strong. And Thibodeau is a coach who falls on the defensive side of a decision. In the fourth quarter when the Heat broke from an 84-83 lead with 5:51 left after a running Norris Cole lefty dunk, it was Wade working against Hamilton who struck for the next three Heat field goals to give the Heat that late seven point lead the Bulls almost extinguished. Though as Thibodeau says when there is a breakdown, it’s a team responsibility. Still, early in the game after that rough start which was even more brutal to open with a pair of air balls and a Belinelli turnover, Thibodeau didn’t hesitate in going to Hamilton despite the infrequent appearances previously. Robinson made a three and Boozer gathered in a Hamilton miss for a score that suddenly got the Bulls within seven before Miami finished the quarter only ahead 30-21. Not a very good beginning, but not an ending. “We hung in there against a good team that jumped on us and fought back,” said Boozer, who addressed the media postgame with his two sons sitting with him and wearing No. 5 Bulls jerseys. “Slowly but surely we got a couple of more stops and a couple of more baskets. Slowly but surely we got better offense and better defense and got a lead. Not to take anything away from the Bulls’ resilience, but this Miami team tends to take games for granted at times. It’s going to get them beat sometime because it’s not exactly a great cast. James, of course, is transcendent. And when they get to it, their pressure on defense is strong, like down the stretch against the Bulls Wednesday. But they loft around a lot of lazy passes and you can take advantage of Shane Battier fronting in the post, which the Bulls had trouble doing without Hinrich. Still, when Butler hit a three with 4:58 left in the first half, the Bulls were leading 38-36 in a dizzying comeback. ESPN produced some immediate statistic about no team in a decade trailing by 18 getting ahead by six so fast as the Bulls did in leading 53-47 at halftime. I think that was on Wednesday’s below a certain latitude, but I’ve asked the analytics experts to vet that. It was almost hard to believe. “I thought we did a great job of keeping our poise even when a couple of things didn’t go our way,” said Hamilton. Robinson with 14 in the half was fouled on a three, making two; Boozer with 19 in the half fought his way up for yet another offensive rebound as that small Miami lineup can be attacked as Chris Bosh went back to observing the basket from near the three point circle. He made a few, but was little factor compared to the previous two games. The Bulls also had spread the court better without so many Robinson pick and rolls. Butler handled the ball on top a few times, and the Bulls were trying to take more shots in transition before Miami set, which always has been an uncertainty in their offense. Wade bricked a one on one move, and Mario Chalmers tossed a layup attempt over the backboard. You know, they could actually win this thing as Nate Robinson closed the first half with one of those And-1 tournament dribbling moves and a three for the six-point lead. The comeback for the Bulls was perhaps summed up in an early third quarter possession leading 61-54 after James opened the half pulling up for a three. This was another of those games he was mostly roaming around looking for passes. He looked to change that in the second half, but sometimes even the kings can’t mass their armies. James tried to throw himself at the basket down the stretch, which usually yields a parade to the free throw line. But the Bulls were waiting this time and he’d be without a field goal in the fourth quarter. In that early third quarter possession, meanwhile, Butler began with a miss and the Bulls dove at the basket like it was a swimming pool on a hot afternoon. Noah rebounded, and then Belinelli and Butler and Boozer and Boozer again and even Robinson as Noah would finish with a pass from Robinson for a layup and 63-54 Bulls lead with 7:23 left in the third quarter. Late in the third, they even lead 75-64. Timeout, timeout! What the heck was going on here? The Bulls didn’t practice Tuesday after the disappointing home loss that put them behind 3-1. They flew early to Miami and Thibodeau convened a team meeting. He isn’t a big coach with the Gipper speeches. But he told the team about beating Miami, how often they’d done it and how well they’d done it. It wasn’t a perfect team. It had it flaws. After that introductory few minutes the Bulls did play, in the end outrebounding Miami 40-32 and 15-6 on the offensive boards, a 34-30 edge in the paint, holding Miami to six fast break points and back to making shots, 44 percent this time. The Heat would get 33 free throws, 15 by James, though this time it was just a play or two coming up short for the Bulls. Though it was oh so close to not happening at least for a few days. Hamilton connected for a three as he lost Wade under a screen, and then Hamilton and Robinson closed the third quarter breaking down the Miami defense and getting fouled. The Bulls would go into the final 12 minutes leading 77-69. If nerves were visible, you could see them in the sun tanned, bleached blonde crowd. But Miami struck back to open the fourth with a Battier three, Chris Andersen converting a fast break lob dunk and then Cole’s running dunk for Miami to finally regain the lead at 82-81 for the first time since midway through the second quarter. Hamilton got it back beating the 24 second clock against tough defense as his veteran grit showed. But then Wade got free for a pair of scores. James then drove and picked up a pair of free throws and Wade snuck in for a followup slam dunk with 3:02 remaining to lead 93-86. Over, eh? It ain’t over until we say it’s over, right Blutarsky. The Heat players like to dance, and they began dancing around as if it were over. Wrong team to do that against. James got blocked trying a little fancy on a drive, and then Boozer followed a Robinson miss to get back within five as Robinson took yet another brutal fall off the ball and staggered off, though he’d be right back in. Heat coach Erik Spoelstra called a quick timeout. He must feel sometimes like he’s herding a kindergarten class the way he often has to remind Heat players to finish things off, whether early in games or late. He has become a very serious coach. Still, the Heat is good enough to get away with the occasional indifference, which also is how good James is. “Best on earth,” agreed Hamilton. James came out of a timeout driving and was fouled. Robinson answered that with a pull up three and—bam!—it was 94-91 Miami with 1:43 left. The Bulls would have their chances. Familiar story. Bosh lost the ball trying to take advantage of Butler on a switch. But Boozer missed from 12 feet. Battier missed a three. But Wade made a good save knocking it off Boozer. Replay validated the call, giving the Heat a valuable possession with 45 seconds left. Miami ran down the clock as James prepared to drive, but Noah stopped him at the rim. No call. James even had been cited for three personal fouls in the game after going almost three games without being called for a foul. He’s good, very good. Not that good. They don’t like playing these Bulls guys. Though you’d have to assume the Bulls like playing them even less. And then the Bulls bollixed up that last possession. They couldn’t get anything quickly going to the rim, so Robinson searched out a three and got a good look that bounced off. Boozer was there again for the save on the long miss. “When you play the Chicago Bulls you wouldn’t expect any finish to be any different, anything less than that,” said Spoelstra. The Heat defended the three point line well as the Bulls drove and kicked and finally shook Butler loose for another attempt, a pretty good look again at a potentially tying three. But he missed and that was it, a season done in hardly surprising fashion the way it went with so many obstacles, accomplishments and near misses. The players got together immediately afterward at center court for one last huddle as confetti reigned down around them and Heat players celebrated. Ray Allen, Cole and Battier came to the Bulls bench to shake hands. Noah met them, as well as Juwan Howard, and they embraced. The Miami stars remained on court to do their TV interviews. Thibodeau greeted Spoelstra. 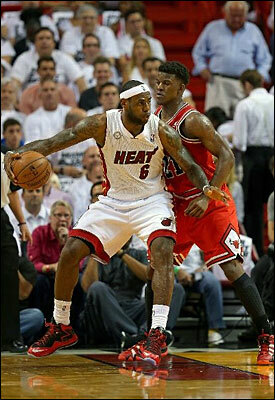 Miami was moving on to the conference finals; the Bulls were going home early again. “I’d love to come back to Chicago,” said Robinson. “I really would. Knowing the guys here, I know there probably is limited space for me. We’ll see how it goes. I’ll talk to my agent and figure out what is the best for me. God has blessed me this far. I love this team and love these guys and if I stay here it would be wonderful. One of those guys here Robinson was referring to was Rose, expected back at full health next season. Hamilton said he hasn’t talked to the Bulls yet about the future. He has a $1 million buyout the team has to exercise in late June. It perhaps was a reasonable summary for the season as well. “Some guys got the opportunity to grow, Jimmy certainly,” noted Thibodeau. “Jo the first half of the year I thought was terrific until some health issues. Obviously concerned with (Deng’s health). That was a big hit him going out in this series. We’ve got a lot of work to do. We’re chasing people. The Heat are defending champions. We’re chasing them until someone can knock them off. There’s room for growth. We’ve got to improve.